Cruciate Ligament rupture is a common knee injury in dogs and can affect one or both knees. 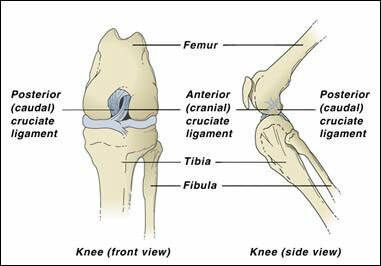 There are two bands of fibrous tissue called the cruciate ligaments in each knee joint. They join the bones above and below the knee joint together so that the knee works as a hinged joint. Normal movement of the knee joint is in one plane, backwards and forwards. Cruciate damage is caused by a twisting injury to the knee joint. This is most often seen in dogs when running and suddenly changing direction so that the majority of the weight is taken on this single joint. This joint is then unstable and causes extreme pain, resulting in lameness. A more chronic form of cruciate damage can occur due to weakening of the ligaments as a result of disease. The ligament may become stretched or partially torn and lameness may be only slight and intermittent. With continued use of the joint, the condition gradually gets worse until rupture occurs. A physical examination will demonstrate laxity in the knee joint. Mild sedation may be required before this test can be performed. Radiographs may also be necessary. Dogs under 10kgs may heal without surgery. These patients are often restricted to cage rest for two to six weeks. Dogs over 10kgs usually require surgery to heal. When one cruciate is damaged the good knee often takes extra weight trying to compensate, often resulting in rupture of the remaining knee. If both knees are affected it is beneficial to operate on both at the same time. There are various techniques available to replace the action of the cruciate ligaments. These surgeries most often involve the placement of artificial ligaments. Your veterinarian, will discus with you the best treatment option for your pet. It is important that your dog have limited activity for six to eight weeks after surgery. Good function should return to the limb within three months and improvement is often instant. Weight control and good nutrition is important to prevent further joint damage and reduce the chance of arthritis in the future.